“How to get rid of acne fast” is probably the thing you’ve Googled for more than once if you have acne. Even though acne is incredibly common, it can be hard to feel confident with blemishes. Unfortunately, there are relatively few fast-acting acne treatments, because it is best to treat acne gently and consistently. Still, we’ve all had that killer breakout at exactly the wrong moment, and there has to be some solution, right? This article will explore what causes acne, take a look at how some of the most common acne treatments work and whether they can work quickly (and safely), and provide some do-it-yourself recipes that can help. Looking for ways to get rid of acne fast? You’re not alone, approximately 80% of people have had acne at one point or another. Acne Is Super Common—So Why Does It Seem So Bad? According to the National Institutes of Health, a subdivision of the Department of Health and Human Services in the United States government, 80% of people between the ages of 11 and 30 experience acne at some point. For perspective, that’s higher than the number of people in America who have smart phones (77%) and only slightly lower than the number of people who have a high school education (88%). Despite being a nearly universal experience, most of us feel embarrassed or even ashamed of our acne. According to the American Academy of Dermatology, acne can even lead to serious mental health conditions, such as depression or anxiety. In this way, acne is a serious health condition, but without the social and psychological effects, it is a normal, relatively harmless occurrence. So why does it affect us so strongly? The most likely answer: because you’re more likely to buy skincare products if you are ashamed of your acne. If acne was socially acceptable, you would have no reason to buy blackhead strips or fancy facewashes or make expensive trips to the dermatologist. That would be bad for the skincare industry, so they need to reinforce the idea that acne is bad, catastrophic even. They do this mainly through aggressively negative advertising. Advertisements call acne “dirty,” “ugly,” and even say that you shouldn’t leave your house with acne. Even if you know companies are just trying to make a buck, these harmful messages can find their way deep into our brains and create internalized shame. So if you’re uncomfortable with your acne, you’re not alone there either. Getting comfortable in your own skin is a life-long journey, but you can take one step forward by refusing to listen to harmful acne advertisements. Literally. Change the channel, mute Spotify, and resist the urge to Google miracle cures, as they almost always rely on shame to convince you that they work. One way to fight the negativity surrounding acne is to understand it. There are four major kinds of acne: blackheads and whiteheads, papules, pustules, and cysts. Each forms in a slightly different way, and can benefit from slightly different treatments. Blackheads and Whiteheads: These two are grouped together because they are incredibly similar. Both are caused by excess skin oil (also called sebum) and dead skin cells getting clogged in a pore. In blackheads, the pore is open, exposing the sebum and skin cells to the air and turning them a darker color, and in whiteheads, the pore is closed, trapping the oil and skin cells beneath the surface. Papules: These are similar to white heads, but they are mildly inflamed. Papules are caused by sebum, dead skin cells, and acne-causing bacteria trapped under the skin. The immune system fights the bacteria and causes the skin to become slightly inflamed, making it redder and potentially a little painful. Papules are usually the precursor to pimples. Pustules: Also known as pimples, pustules occur when acne-causing bacteria have gotten trapped under the skin and the immune system has successfully fought off the minor infection. The immune system sends agents that destroy bacteria, but in the process they also destroy themselves. The resulting dead cell matter creates pus, which gives pimples their white or yellow color. Cysts: This is generally considered to be a more severe kind of acne. Cysts are large, raised acne lesions, and they can happen when acne-causing bacteria trick your immune system into fighting your own skin. P. acnes, the bacteria primarily responsible for acne, can release certain chemicals that attach to your skin. Your immune system detects these chemicals as bacteria, and tries to destroy it, which allows the real bacteria to continue to grow and hurts your skin in the process. Cysts occur when this cycle does not self-correct and the infection grows. Even though skincare companies are manipulating us to get us to buy their products, and there is nothing inherently dirty or bad about acne, it’s not also a bad thing to want clearer skin. Reducing your acne while still being kind to your skin is not a fast process though. There are some tips and tricks for how to get rid of acne fast that could help slightly, but they are short term solutions that will likely do your skin more harm than good in the long run. Instead of chasing temporary results and falling into a cycle of clearer skin followed by worsening acne after the temporary fix has worn off, look for something more lasting. The best acne products are gentle. It can be tempting to use harsh products and scrub vigorously, but this can irritate your skin, causing it to produce more sebum and further clog pores. Additionally, it could dry out your skin, causing your pores to close, trapping bacteria beneath the surface. It will take longer, but gentle acne products are always better for your skin. With the right daily care, you won’t have to worry about how to get rid of acne fast, because it won’t even be there. The best acne treatments use quality ingredients at safe concentrations, and they usually involve more than one step. This makes things more complicated, but it also treats all of the causes of acne, instead of just one or two. It can also make sure that your skin stays healthy as your treat your acne, which is key to preventing acne scars and skin irritation. Exposed Skincare combines nourishing natural ingredients with just the right concentration of acne-fighting active ingredients to improve your skin. One treatment system that helps reduce oil, clears away dead skin cells, and kills acne-causing bacteria is Exposed Skincare. Unlike skincare companies who will tell you anything to convince you to buy their product, we just recommend Exposed because it works for most skin types, and is much cheaper than seeing a dermatologist. Because Exposed is so gentle, it works best with sensitive, dry, or normal skin types, although it can also produce good results with oily skin types. However, some oily skin types would benefit more from something a bit stronger, like the Skin Balancing Kit from Paula’s Choice or Proactiv’s new ProactivMD system. Okay, so a full acne treatment system is better for acne overall, but if you’re still searching for solutions for how to get rid of acne fast, there are a few acne treatments that work quickly, such as light therapy. You may have seen the commercials for the Neutrogena Light Therapy Acne Mask, a mask that shines blue and red light onto your skin for 10 minutes. It might sound silly, to treat acne with light, but there is actually some solid science behind it. Blue light and red light work differently, but both can have positive effects on the skin, although they are not the right choice for everyone. Blue light can kill bacteria on your skin, which makes it less likely that bacteria will get trapped under your skin and create a pimple. To understand how blue light kills bacteria, think of an opera singer breaking a glass simply by singing the right note. The glass has a natural resonant frequency, and sound waves have their own frequency. When the opera singer reaches a pitch that creates sound waves matching the resonant frequency of the glass, it shatters. Light also has frequencies, and blue light’s frequency matches perfectly with the resonant frequency of p. acnes bacteria. This destroys the bacteria’s cell walls, effectively killing them. Because it kills bacteria, blue light is an interesting preventative measure, but it does not usually help with acne you already have. Red light, on the other hand, could provide one answer to how to get rid of acne fast. It will not get rid of your acne, but it could unclog pores and reduce inflammation. Red light works as a gentle heater, warming the sebum clogged in your pores so it is removed more easily, and it activates an anti-inflammatory chemical in the sebaceous glands (glands that produce sebum). Combined, this means fewer blackheads and reduced redness, which could make acne less noticeable. Spot treatments are the ideal solution for how to get rid of acne fast, but many of them are too harsh or just don’t work. The best way to know what to expect from a spot treatment is to read its label. Most acne products contain active ingredients that have been proven to treat acne, like benzoyl peroxide, salicylic acid, glycolic acid, and retinoids. Benzoyl peroxide kills p. acnes, so it’s a common ingredient in many acne treatment products, but it can also be very drying. The best concentration of benzoyl peroxide for most people is around 2.5%. Salicylic acid is another popular active ingredient because, at 0.5-1% concentration, it is a gentle exfoliator, removing blockages in pores without irritating the skin. It’s so gentle that it is often not effective when used alone, but it combines well with other acne treating ingredients. Glycolic acid can help exfoliate the skin and encourage new, healthy skin growth. It is somewhat similar to salicylic acid in that it’s a gentle ingredient when used at 1% concentration or lower and usually works best when combined with other ingredients. 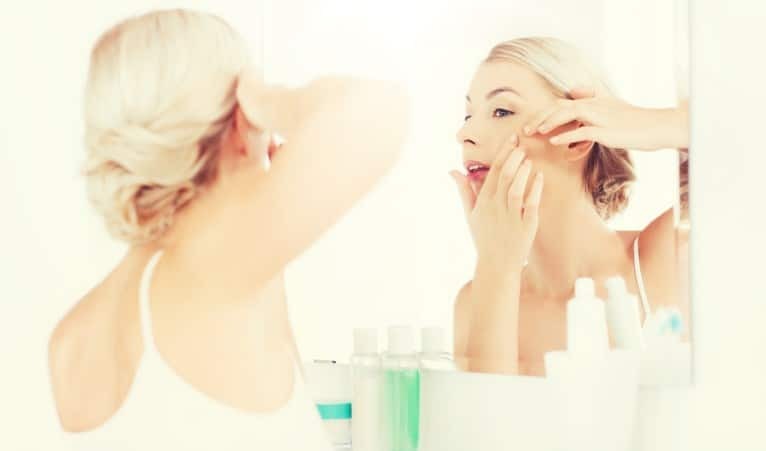 Retinoids are much stronger than the previously mentioned ingredients, and are typically unavailable over-the-counter at concentrations over 0.1%. This can be a good spot treatment option because retinoids reduce inflammation, making acne less noticeable. Most spot treatments contain one or more of these active ingredients, but many use a concentration that will only irritate your skin and perpetuate your acne. Because you aren’t applying the product to your full face, spot treatments can use slightly higher concentrations, but only slightly. Some spot treatments use 10% benzoyl peroxide or 0.4% retinoid—which is much, much too high. At those concentrations, wherever you apply the spot treatment, your skin is likely to get irritated and turn more red, not less. To save you some internet research, we’ve found a few answers to the question of how to get rid of acne fast. The following products are acne spot treatments that contain acne-fighting ingredients at concentrations that are strong enough to reduce acne quickly, but still good for your skin. Neutrogena Rapid Clear Acne Eliminating Spot Gel: This spot treatment contains 2% salicylic acid, higher than recommended for all over treatment, but perfect for addressing small areas. To prevent drying, it is also combined with witch hazel and glycerin, ingredients which soothe and moisturize the skin. Differin Gel: This product is one of the only over-the-counter retinoids currently available. It is advertised as an all over treatment, which may work well for oily skin types, but for dry or sensitive skin, Differin will probably work best as a spot treatment, to prevent drying. Murad Blemish Control Rapid Relief Spot Treatment: This spot treatment combines salicylic acid with sulfur, a gentle drying agent, and the combination is a great solution for how to get rid of acne fast. The sulfur dries any excess oil that could be trapping acne-causing bacteria, and the salicylic acid exfoliates the skin to remove dead skin cells, reducing redness and leaving skin smooth. If you have a pimple right before something big, like prom, a job interview, or a big presentation, you don’t have time for your gentle skincare routine, or even a strong spot treatment to take care of it. You might be very tempted to pop it, but you’ve probably read in every magazine and on every website that you should never, ever pop a pimple. We don’t recommend popping pimples either, but it may not be the cardinal skin sin many sources make it out to be. If you have a highly visible pimple and don’t have time to let it take care of itself, popping it could be your only option for how to get rid of acne fast. Before you pop, there are important safety tips you should consider. First, if the pimple does not have a clearly defined head, it is still a papule and you should not pop it. It may be raised and visible and you may want to get rid of it, but you will have to break the skin to do so, which means it will likely scar. Instead, try one of our DIY solutions below. Second, if you have long nails, trim them or be careful to use only the pads of your fingertips. Using nails to pop a pimple is another surefire way to break the skin more than necessary and cause scarring. Third, wash your face and hands before and after popping. Your hands are notoriously germy, and popping a pimple could allow those germs under your skin. And when a pimple pops, bacteria are released, and you don’t want to spread that to other areas of your face. Finally, if you are popping a pimple and see clear fluid or blood start to come out, stop popping. It may not be completely gone, but continuing to push and press your skin could lead to scarring. Although popping pimples is definitely not the best choice for how to get rid of acne fast, it can be safe if done correctly. When looking for how to get rid of acne fast, you’ll find plenty of typical acne products, but they have a tendency to be extremely drying. This doesn’t treat all acne, and it can irritate skin and lead to more acne down the road. If you want to get rid of a blemish fast, some of your best options are actually do-it-yourself. Note: These options are not meant to replace a full acne treatment system. They can be great supplements though! Honey is one of the only products that has any business calling itself a miracle cure. Humans have been using honey for centuries to treat everything from an upset stomach to a nasty cough. It can also do wonders for acne. This is because it is anti-inflammatory, antimicrobial, and has wonderful healing agents. Doctors today still use honey-infused dressings when treating wounds, because the honey helps speed recovery. Because acne is technically a type of wound, honey can benefit acne in a powerful way, and it works relatively quickly. If you’re looking for a DIY solution for how to get rid of acne fast, honey may be your best bet. To use honey as a spot treatment you can use the following recipe, but it also works extremely well on its own. You won’t see perfect results, but at the very least, it should reduce some redness. Combine the ingredients in a small bowl. Using one finger, apply a small amount to the affected area and let sit. This mixture can be used as a 15-20 treatment, or it can be applied before bed and let it sit all night, although it can get pillows and bed sheets sticky. After the desired amount of time, gently remove mixture using lukewarm water, and pat dry with a soft towel. This essential oil is a popular acne spot treatment because it has such strong antibacterial properties. It is far too drying to use all over the face, and even as a spot treatment it should be used sparingly. If you have dry or sensitive skin, this may not be the best spot treatment for you. Even if you have oily skin, tea tree oil should always be used in a diluted form, like a gel, or you can combine the oil with other acne-fighting ingredients. The following recipe combines tea tree oil with another great at home remedy, aloe vera. This combination works very well because aloe vera is naturally soothing to the skin, so it prevents any irritation the tea tree oil could cause. Even though there is no perfect answer to how to get rid of acne fast, tea tree oil and aloe vera comes close. Combine the ingredients in a container that has a lid. This will produce a significant amount of spot treatment which can be used for one to two weeks if stored in a cool place. Apply the mixture to the affected area and let sit for no more than 20 minutes. After the allotted time, rinse with lukewarm water and pat dry with a soft towel. Ice is similar to honey, in that it can help with just about anything. Unlike honey, ice won’t help with bacteria or clogged pores, but also unlike honey, it can improve the appearance of inflamed acne almost immediately. Ice is anti-inflammatory and numbing, so if you have acne that is particularly red, swollen, or painful, ice is a great option. Take an ice cube and wrap it in a thin washcloth or several layers of paper towels, and gently press it to the affected area. Ice works best when applied for 20 minutes, then removed for 20 minutes, and then applied for 20 minutes again. You can continue this cycle until the inflammation has subsided. Thankyou for all the information. I'm 55yrs old and haven't had pimples before. Your article gave me the facts to discuss with my Dr and I believe that each patient should know the facts so together they can find a solution. Thank you for being so informative and thorough. I feel positive that thier is a solution. Is there such thing as natural remedy for treating pimples? It has been my problem since I got autoimmune disease. All these ideas are great. Also, one can go for a good dermatologist tested product. I would recommend to use Zeroblem. It is a Solvaderm product and easily available online.